This morning I thought about stories. I shared a story with my students of events that actually occurred. 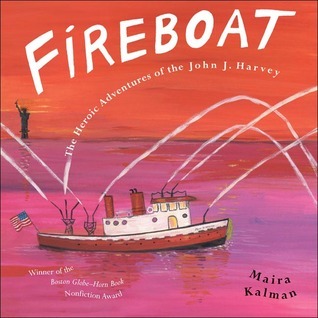 I read aloud Fireboat: The Heroic Adventures of the John J. Harvey. I've cherished this book since I first read it, and I value the way in which it tells the story, and also the focus it has on bravery and those who helped during this time. I shared this story because it is September 11th. I shared this story with 7th graders who were less than or around a year old at the time of the attacks. I vividly remember where I was and how I felt and what I did when I heard the news, but my kids don't. So how do we share the feelings of events with someone who wasn't there? How do we try to help them understand what it was like? We share stories. Since the dawn of time, we have shared stories. When tragedy occurs, we share stories of those who were there and those who weren't. When we need to process events, we share stories of the causes and effects. When we want others to understand, we share stories from multiple perspectives. As I told my students, You may hear about the details in social studies class, but what do you think we'll do in here? They all knew. We would read a story. I am so thankful for the authors who do the hard work of telling stories of real events. I asked my students to reflect on: When we read stories about things that have happened, how does it help us understand them better? Well, here's what I think: Stories of real events give me a way to help my students have a better understanding of the world. They give me a way to show my students other perspectives in a non-threatening way. They give me a way to show students things that have happened. They give me a way to talk to my students when I perhaps can't find the words myself. We share stories because they bring people together, they explain what has happened, they add the human element to events, they touch on emotions, they help us to understand. So today I shared a story, only one of the very, very many that there are from an event that affected and touched so very, very many people. But in all of that, we went back to the story.